We do a lot of talking to Ag folks of all stripes — and no matter what kind of agriculture you believe in, at its very core, it is the intersection of nature and man. 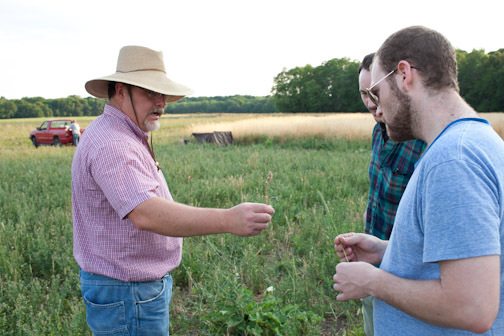 In agriculture, man seeks to leverage nature to his advantage. But there is another side to how nature and man interact, one of mutually sustainable coexistence, and Darryl Coates lives in that space. Darryl, District Wildlife Biologist for the Illinois Department of Natural Resources, was the gracious star of Meal Four: Diversity, Sustainability and the Anthromorphizing Biologist. I call him that because when you talk to Darryl about animals and nature, he tends to slide into feelings — his own, the environment’s, the animals’ — within a sentence or two of every paragraph. I was particularly fascinated by this biologist who talked about his pig’s feelings because, of course, biology is science. And I’ve heard a lot of folks who seem to use science as justification for, say, depigifying our pigs. In fact, I get a general feeling of derision and scorn, like I am an un-evolved human, when I dare to hint that pigs are happiest when they are doing piggy things. So, Darryl’s ideas, frankly, felt like home to me. It was a relief to have a scientist confirm that pigs do have an essential pig nature and expressing that in their lives is vital. Which is why I was hoping that Darryl, since he was a scientist, could help me sort through the sciencification of agriculture. For me, this is an essential conversational fulcrum if we are going to somehow bridge the gap between BigAg and LittleAg — it’s the piece those on “our side” won’t let go of and, I’d argue, the piece that BigAg can’t afford to ignore. I am learning through this One Hundred Meals project that our culture, no matter how much it frightens me personally, seems destined to embed science into every nook and cranny of agriculture. And so, if agriculture is going to hinge upon science, then I feel we need a way to work a sane perspective of sustainability into the equation. Sustainability, in my opinion, is ground zero of the divide between the Big Ag and Small Ag folks. And by that I am not saying that both sides don’t claim the vast superiority of their view of sustainability, they do — but they are so diametrically opposed in their idea of what the word means that the word itself is ineffectual in any discourse. To Darryl, who I should note has not yet logged his official answer of what sustainability is, lack of sustainability results in disease, pollution and starvation. “Not human starvation, nutrient starvation.” And he focuses a lot of his conversation on how nature will ultimately weigh in if an ecosystem is unsustainable by the manifestation of disease, pollution and starvation. Too many wolves in a wood — the herd gets culled naturally by lack of food. Planting the same type of vegetable in the same spot in your garden each year — the bugs and disease will concentrate in your soil and doom your crop before you can start thinking about dinner. Not enough diversity in the field corn grown in the United States — something will eventually give. And the odd thing is, from the potato famine (in Ireland) to the potato blight (in America) to, say, Dutch Elm disease, we can see this pattern again and again. It is a pattern, really, that defies any idea of sustainability because nature delivers disease, pollution and starvation, it seems, every time it encounters an unsustainable lack of diversity. Darryl talks a lot about diversity. In many ways his job is focused on the impacts of the lack thereof. Take those Dutch Elm trees. They were densely planted in a community near him because it’s just plain ol’ easier for the community leaders to just buy one kind of tree and plant it in mass. Plus, it must be acknowledged, most communities like the symmetry of a stand of similar trees. Here’s the thing, though, The environment of those trees, densely planted with no diversity, was unsustainable and so they succumbed to disease and were replaced, essentially wholesale, with ash. Of course they ended up diseased and now the talk is replacing them, all of them, with maples. Darryl anticipates that in 50 years, maple blight will ravage the trees planted because no one seems interested in learning mother nature’s lesson just yet. It’s hard to imagine why man doesn’t seem to ever learn this lesson. And as Grant and I prepare to travel down to St. Louis to tour Monsanto, this idea of diversity — and the growing lack thereof — is what is weighing on my mind. I think it is a first step to discussing how science and sustainability can intersect. After all, I am quite sure there is no argument against the idea that biodiversity is essential to human health and sustainability. This is scientific fact. And yet from my perspective, the deeper a person bows to the altar of science-based agriculture, the more they seem to ignore the science of biodiversity. And no, I am not referring to the cursory nod to diversity in the form of rotating between corn and soybeans with a cover crop on the off-season. I’m talking actual thriving diversity — of seed, of crop, of fostering beneficial insects as well as allowing for the wild experimentation that comes from naturally occurring adaptation of breeds to environment one gets from heirlooms rather than hybrids. And since the Monsantoization of agriculture seems, to me, the titillating height of anti-diversitism, I should be interested to hear how the scientists respond. Is it the lure of productivity? The idea that, if you consider this year, growing one type of corn in the field is the most productive and thus the best? Will they ignore the question and divert the conversation to feeding starving folks, which tends to happen a lot. Or is there some bit of their argument, a valid point, I have yet to hear? A part of me wishes that Darryl was coming with us to Monsanto, since he has access to his scientific background to inform his questions and comments. But, thankfully enough, Darryl’s ideas are blissfully simple, in the way mother nature is, at its core, quite incredibly simple — diversity works well and nature tends to ensure the sustainability of all species by keeping everything in check. And when it gets out of whack, for whatever reason, the mother will react like a woman scorned. This entry was posted on September 10, 2012 by elliecm. It was filed under Meal Post and was tagged with Diversity, monoculture, Monsanto, Mother Nature, Sustainability. Pingback: Just Farmers » Sustainabile Agriculture, What Does it Mean? Pingback: Sustainable Agriculture, What Does it Mean? « Biology Fortified, Inc.